This second time round the design cycle was completed relatively quickly due to several factors. One was I was much clearer about the design process. Also I had been supporting on BPT’s courses, including the PDC, Forest Gardening and Practical Permaculture Gardening, as well as reading up on garden design, most importantly, Gaia’s Garden by Tony Hemenway. We were much clearer about our vision as a family. We had the experience of the first year in the garden and the wonder of the garden itself after a year to inform, encourage and inspire us. Using the functions, systems, elements analysis, we knew which elements would care for the land and care for our aspirations. It remained to place the elements so that they would thrive and create beneficial connections between them. Moving from pattern to detail, I went on to explore the beneficial connections for each element by creating soil/plant/wildlife communities or guilds. 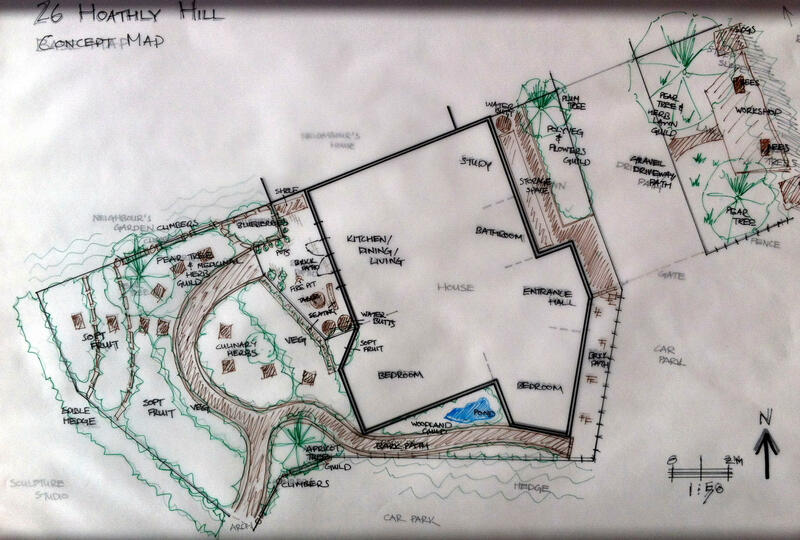 The design was based around the main aims: soil building, harvesting and recycling resources, and building connections. Working with the heavy, clay soil and aiming to enliven it, we used the resources we had locally. The soil is a major part of this aim in capturing water and fertility in the soil. Harvesting rainwater, we installed two new waterbutts to add to the existing two. Harvesting graywater, we bought a plastic bowl for the kitchen sink. A graywater system will be a new project/design. 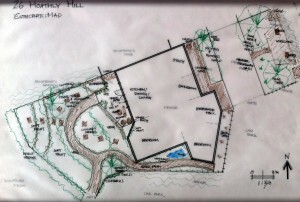 After the initial implementation of the design, we will use the community compost area. It is about five minutes walk within the community and we consider it to be within our zone 1. We use a plastic bin to collect our scraps to make it worth the trip. We use the journey as a way of connecting with the community and walking meditation! We created paths along desire lines around the house, notably although we felt strongly about maintaining our privacy in the garden, we kept the gateway towards the back which we often used and gave us both a front and back route to the community and the car park. We created paths in front of the house and at the side to be able to access the storage spaces. The paths were made from bark mulch bought from the local, family run business specialising in tree care, fencing, grounds maintenance and composting. To create the raised beds, we used reclaimed timber from the local wood recycling store as well as left-overs from our building work. We decided to use bricks for the areas outside the front and back doors where we have most traffic, wanted more permanent and sturdy paths and to create a buffer between the bark and gravel paths and the house. We used bricks from the local brick works. the side garden: often walked past, shady due to fence and planting to gain privacy from car park, narrow, ideal for storage and a more wild garden. Seeing the garden as a living organism and creating connections or even communities between the soil, the plants and the animals in the garden, I used the following template adapted from Tony Hemenway’s work. See below for the details of the plant guilds. This was all about nurturing wildlife in the garden – see below for the guild. With this element, we wanted to connect with zone 5. There are multiple benefits for encouraging wildlife into the garden. My son also was wanting to have a pet and we agreed that caring for and encouraging wildlife into the garden would be better than having a pet.